Skulls and Bacon: BaconAddict.com Bacon Wristband Giveaway! Congrats to the winners of the BaconAddicts wristbands! They are Courtney Fisher, Dana M Lane, Parrish and Aaron. 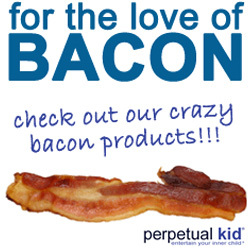 Baconaddicts.com is like a one-stop shop for most of your bacon needs. They've got everything from The Bacon Explosion to Bacon Jam to Jim Beam Bourbon Bacon Mustard. 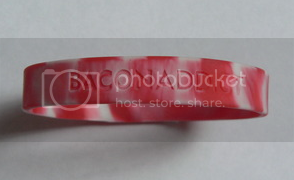 They also have these snazzy rubber bacon bracelets and were nice enough to send a couple to give away! 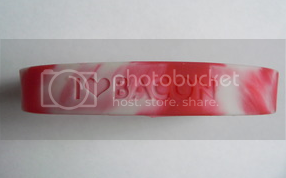 Three lucky readers will win one of the bacon wristbands pictured above. All you need to do is leave a comment and let me know what's your favorite way to eat bacon. Winners are chosen at random (I throw the names into a hat) and the contest is open until Friday 5/4/2012 at 11:59pm. Please make sure to be logged in when you comment so that I'll be able to contact you if you're a winner! PLEASE NOTE: If you leave a comment as Unknown or anonymous, I won't have any way to contact you if you're a winner! Please make sure that you are logged into an account with your contact info when you leave a comment. more seriously usually cooked on the griddle before pancakes is how I usually eat it, but one of the most delicious was as bacon jerky. Favorite way to eat bacon, hmm so many options. Probably cooked up nice and crispy and eating it straight. I usually eat bacon all by itself. Second favorite version is dipped in maple syrup. I would so wear one of these! I love Bacon when it's cooked with love! I love bacon on my bacon! :) But really- I had toast one night and put bacon bits all over it, and covered it with a slice of cheese... Best. Toast. EVER!! i love bacon with fried eggs and grape jelly. weird? yes. awesome? hell yes! I love bacon with maple syrup, but my very favorite way to do it all fancy is put it in blue cheese or fontina danish for breakfast. The cheese, and the bacon are like the more fantastic orgasmic taste explosion in your mouth. Bacon, well crunchy, is best drizzled with pure, dark maple syrup. But it's pretty darn hard to ruin bacon! I like to eat my bacon in a Bacon weaved taco. i like bacon wrapped around a cheese stuffed meatloaf on the grill. There is nothing better than bacon. I pour the oil on to dogs food. I'd love to drink myself but wife stops me. In fact, my house smells like bacon. Plain and Crispy.....2nd choice wrapped around a pan fried scallop. My favorite way to eat bacon is a combo: I love to have Eggs Benidict (with bacon instead of ham) on it with a Bakon Mary (Bakon Vodka, Pearl Cucumber Vodka, and skewered with 3 THICK CUT slices of Peppered Bacon, 2 pearl onions, 2 slice of dill pickle, a celery stick and a bacon n blue cheese stuffed olive). BEST BRUNCH EVER! My fav way to eat bacon every since I was a kid with my grandma is bacon sandwitchs. Now I just make it by the pack and make 4 sandwitchs with nothing but bacon on it and munch on the extra. Another way is to smother it with syrup and eggs mixed in a giant bowl. But normaly if I'm to lazy I just make a pack and eat it by itself. Maple Smoked Bacon all by itself... then cook some diced up potatoes in the Bacon grease! Yummy!!! My favorite way since I was a kid with my grandma is to eat plain bacon sandwitchs. Now I make bacon by the pack, make 4 sandwitchs with nothing but bacon on it and ten eat the left overs by itself lol. The other way I do it is just make a pack and start munchen lol. When I'm not lazy I love to make a pack of bacon, 5 eggs in a big bowl smothered in syrup. Sorry, I love talking about bacon lol. I love dipping it in my sunny side up eggs witch my grandma would call dunkaroos and I order bacon with everything and just eat half by itself and half either with or in my eggs, in syrup or on bread. Just anything really. i like to bake it sprinkled with brown sugar. YUM! I love my Bacon rubbed down with Bacon Salt and pan fried until very crispy with a bit of chewiness. My favorite way to eat bacon is in mass quantities! Here's some pictures of my last shipment! Aaron @ The Bacon Nation. I make bacon turtles. Make crunchy bacon and use it like you would usually use nuts, caramel, and dip into chocolate, sprinkle with a pinch of sea salt. My best invention ever! My absolute favorite is to fry it up and while it is still in the skillet add some brown sugar and let it simmer a few seconds. Voala! You have maple crusted bacon-yum! There is no right way to eat bacon. By itself is OK. Wrapped around something is good too. As a part of a recipe is not a problem. My favorite way to eat it is with friends! Bacon wrapped shrimp is one of my favorites. Also bacon wrapped cocktail sausages cooked in brown sugar are porktastic! Yummy BACON I can't leave you even though I can't eat you, was diagnosed with high blood pressure two days ago and must fix myself before eating you again, but will aways follow you! @Beckett's table in Phoenix Arizona where it is cleverly incorporated into Chocolate Bacon S'Mores. Yeah you heard me right. FREAKING CHOCOLATE BACON S'MORES MO-FOS!!! 50/50 BLT is my favorite,,, A 50/50 burger on a BLT sandwich. I enjoy my bacon straight up: fried crispy and perhaps with some maple syrup (and pancakes)! I wanted to share my love of bacon in song. Here's that song.